Hey there everyone! I have fun news to share. 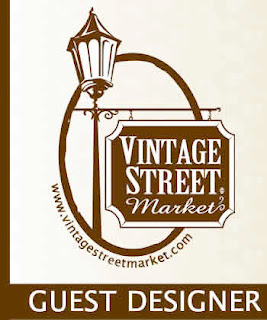 This month I am the featured guest designing with a fabulous company, Vintage Street Market. 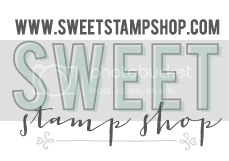 They sell wonderful kits with specialty paper and tags using nostalgic graphics and versatile accessories like their tinted tape. You can find the link right here! The first project I made was button book is die cut from coaster board, which allows a thicker more stable surface to embellish. 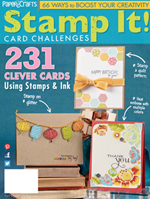 Button card stamps were applied to the pages as well as the printed cardstock die cuts that come from the Dimestore Vogue kit! 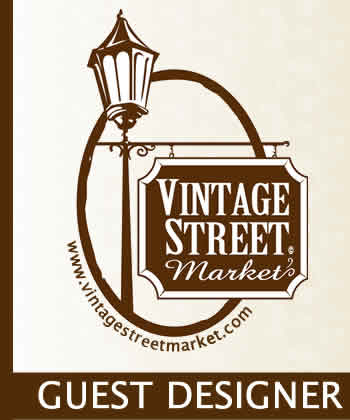 Making a strong focal point with vintage items, pins, buttons and trim focuses the eye on key elements of each book. Because of the realistic shadows of these button dies, I backed them with foam dots to make them 'pop' off the card with dimension. One of the fabulous aspects of these kits is that each element has shadows that make it look 3-d! To emphasize this feature I threaded the ribbon slider die cut with crochet trim to make the threader stand out and look 'real'. 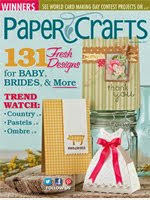 Making your own embellishments with the crepe paper included in this kits was super fun and easy! Trim a strip of thin crepe paper to 1/2" x 5" and roll into a coil, twisting as you go. Add a pearl to the center and you have a fun little matching flower embellishment! The next project that I created was a party favor box including games. 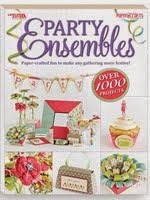 The Party Games line is perfect for a kids party with it's fun colors, distinct images and it's sense of whimsy! 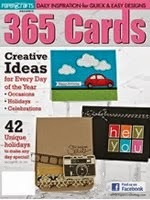 I had a difficult time deciding on what to use since I love the polka dots and the collage of fun party-themed images. I decided on something that showcases the praticality of this line of product! So, I made a pillow box with party games that fit inside that you can give to each of your party-goers. 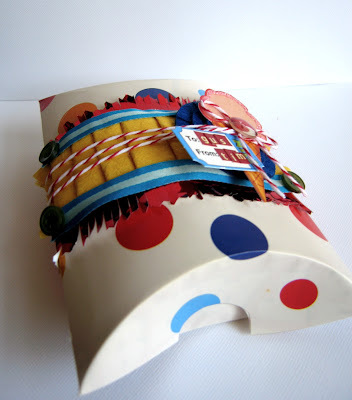 The pillow box is a pre-made box from Paper Source that I lay flat. 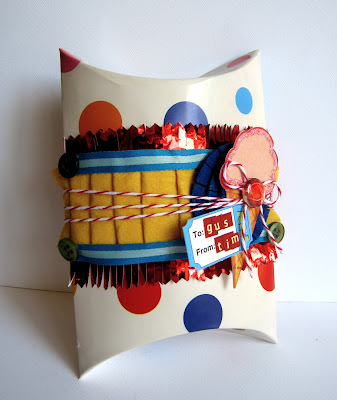 I traced the shape onto the polka dotted paper, scored along the folds, cut out and attached to the pillow box. Now, all you need is to decorate it! I trimmed the red foil paper edge's with fringe scissors, then with pinking sheers and rolled them a little to add flair. Then I pleated the crepe paper to the foil trim and covered the 'seams' with ribbon for a clean look. To make your own games to add to the color-by-number and connect-the-dots games, you can make "Bingo" and "Memory" games. 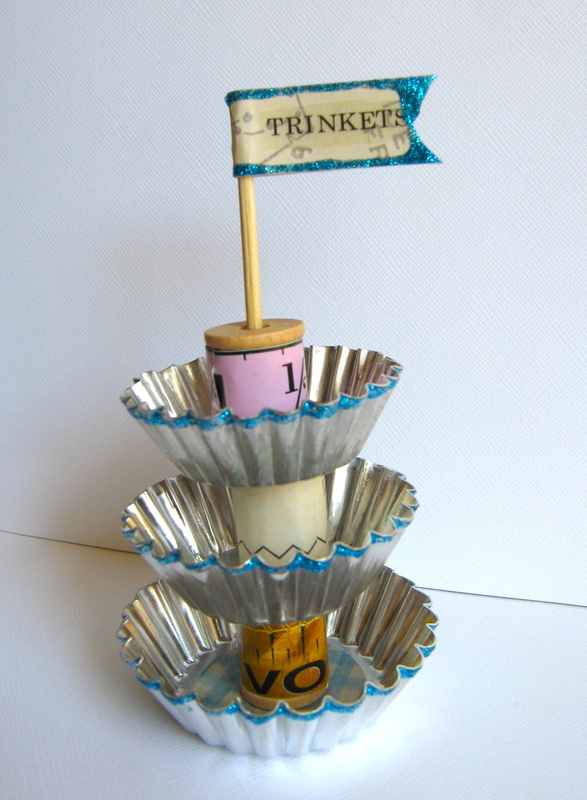 To make the Bingo game you can make the Bingo chips with Epiphany Crafts Epoxy tool. Simply punch a circle from the patterned paper, and adhere the epoxy! They little chips fit perfectly in the squares. You could even play the game at the party (just make sure to change the numbers on each card, or else everyone will get "Bingo" at the same time!) To make the Memory card, simply punch the animals from the paper, back it with the same colored cardstock and create a little pouch from a kraft glassine envelope. The next project that I made was trinket container that can hold sweet little gifts and tiny treasures. 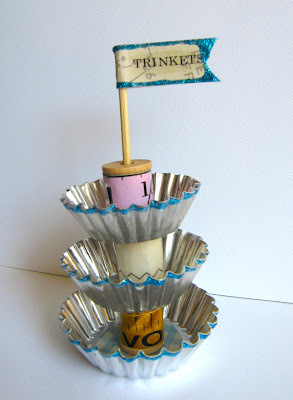 To emphasize the element of "notions" you can wrap little strips of patterned paper around wooden spools and use them to separate the tins and add height as well as hold! 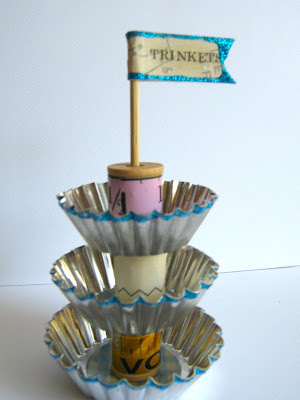 A wooden skewer holds a little pennant with the word "trinkets"
Adding some glitter glue brings out the cute scallops of the tins, and adds a pop of color! The final project that I'd like to share is a wall hanging. They're easy peasy to decorate and people love to receive such thoughtful gifts. 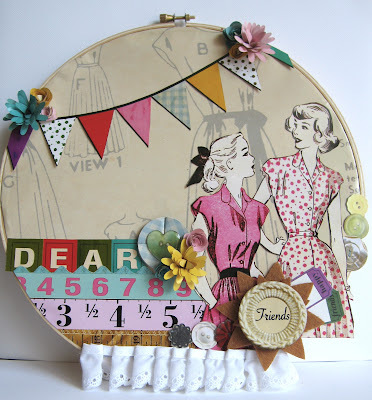 I knew that an embroidery hoop would not only be a fun shape, but would go PERFECTLY with the Dimestore Vogue line! Simply place the outter (larger) hoop on your patterned paper, trace, trim and add mini slits inside the circle to help you smoothly fold the paper edges inside the hoops. 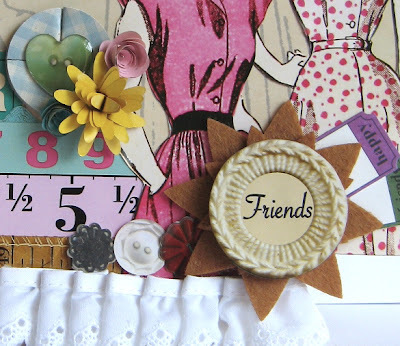 Die cutting spiral flowers from coordinating paper really draws everything together. Playing around with sentiments is the funnest part. I took a button image from the patterned paper that said "Friends" and placed it on a felt flower from Epiphany Crafts and then trimmed letters to spell out "Dear." Don't be afraid to make your own embellishments! The heart is a handmade epoxy from Epiphany Crafts that was affixed to eight folded circle punches! HOLY COW!!! So many fabulous creations! I looooove that party favor for the kids...and the trinket tier! SO Cute:) I was just thinking the other day how I wanted to make a wall hanging--why are you so clever??? LOVE LOVE LOVE! EM!!!!!! OMG I LOVE!!! and your photos are AWESOME!!! Although I actually came by to say congratulations to you on being in the top 20 for Gallery Idol!!!! When I saw that house card of yours I knew they'd be crazy not to pick you as a finalist! Best of luck to you...I will be voting for you! Awesome work, Miss Emily!! 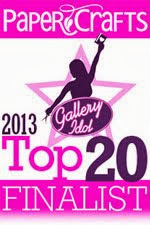 AND huge congrats on making the list for Gallery Idol top 20--well-deserved!! So happy for you! Wowsa!!! Gorgeous projects! Congrats on gallery idol!!!! I adore your work!!! Good luck! 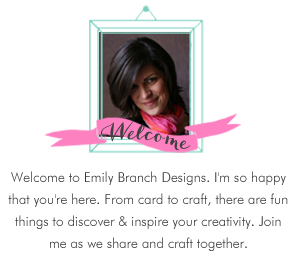 LoVe all of your yummy creations here Emily. Just popped by to say a HUGE CONGRATULATIONS on being picked up in the top 20 over at Gallery Idol! Way to go girl, your card is FAB!! awesome projects...wow...congrats on making the top 20 over at Gallery Idol!